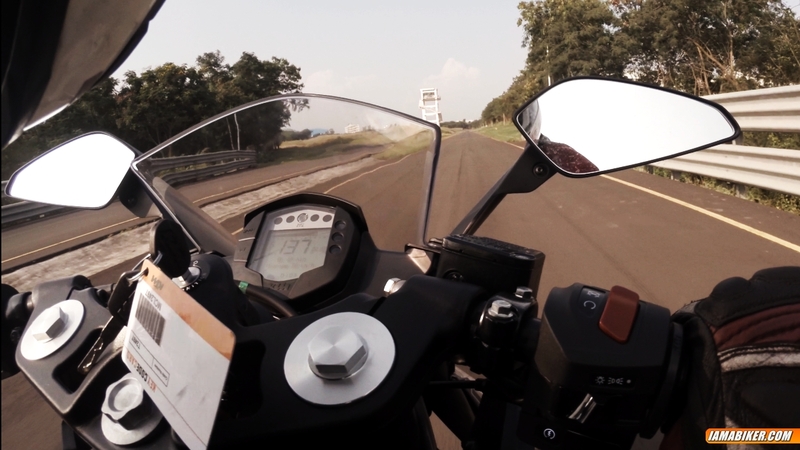 It’s not always that you get to test a motorcycle at the manufacturer’s own test track, so when the call came in, all schedules were cleared and a trip to Bajaj’s Chakan test track was made. 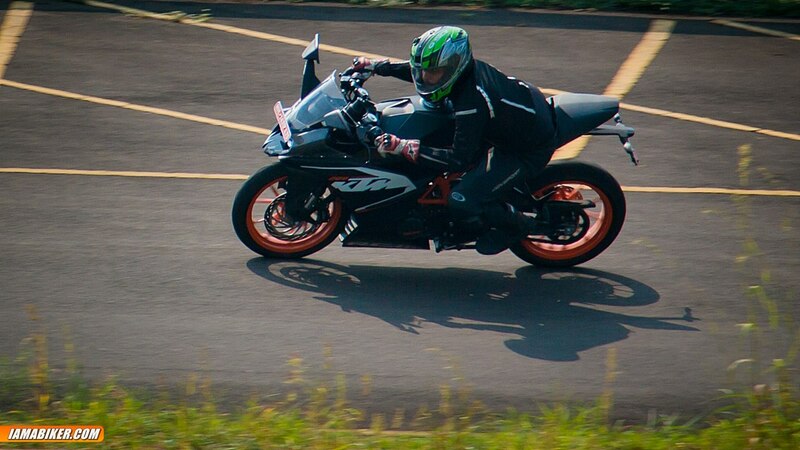 While we rode both the KTM RC390 and the RC200 on track. 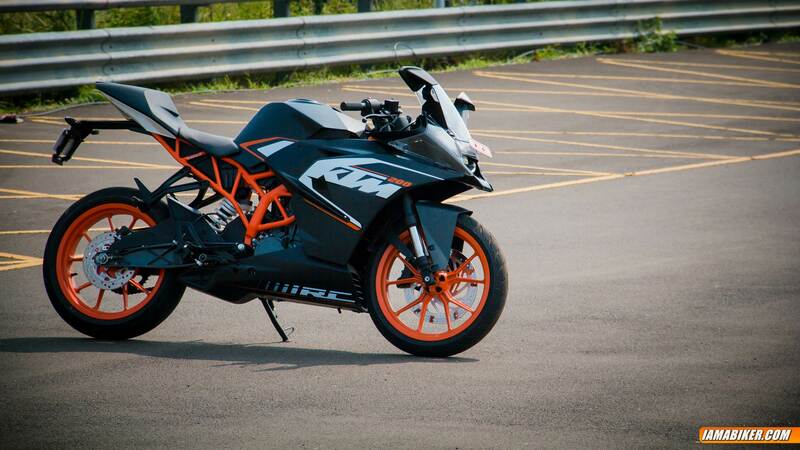 We have a little something else cooking with the RC390, a video review, the teaser of which you can see below. 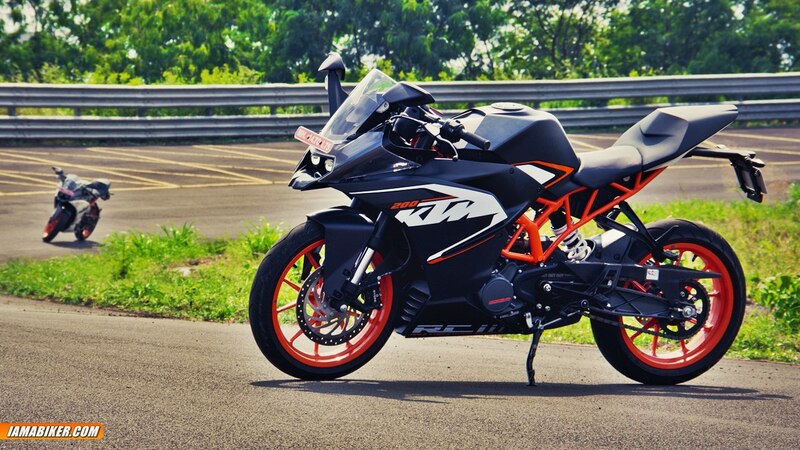 So that leaves us with the KTM RC200. It was the first time we were seeing the RC200 in flesh. 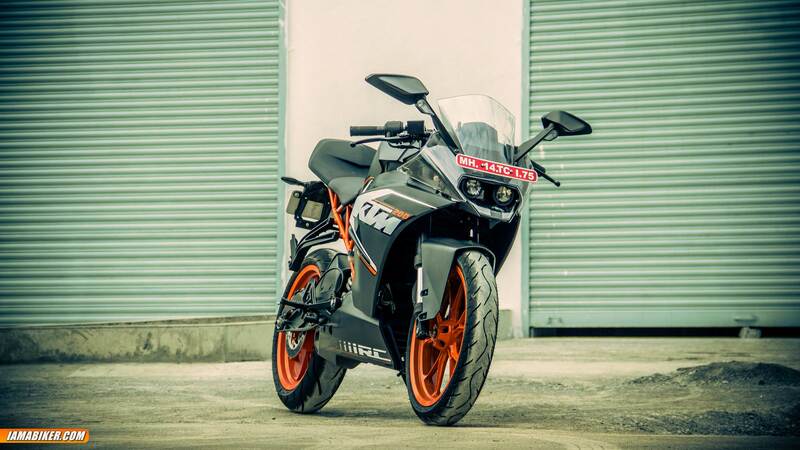 Not that it is any different from the RC390 in terms of shape and design, but the matte black paint scheme along with the minimal decals, come together to make one hot looking motorcycle. Any day it looks much better than its elder sibling. Let’s get to the riding bit, shall we then? Start the machine and if you are someone who frequently rides a Duke, either of them, then immediately you will notice that the motorcycle now sounds a little more soft, a little. Maybe it’s the fairing, maybe it’s just me wanting something to be different, but yes I’m sure Duke riders will agree that there is a difference. We were lucky with the track conditions. What started out as a wet day, quickly turned nice and hot. Good because the RC200 comes with the MRF’s and not the super sticky Metzelers. Took the first lap slow to understand where the limit of the tyres come in, but as the temperatures were pretty high by then things were ready quickly for some hard riding. The engine, gearing and everything else associated with the performance are the same as that on the Duke 200. The biggest question then would be, has the increased weight of the faring brought down the performance. The answer to that is, no. Even if there is, it is so marginal that you will definitely not notice it. The 0 to 100 came up in 9.5 seconds, same as that on the Duke and we clocked a top speed of 137 kmph on the back straight. The riding position is as expected, it is the full deal, a full sporty position. The good bit is that taller riders are comfortable and fit in just fine, no issues with the knees being where it shouldn’t, but I feel for shorter riders it is going to be a bit of a reach and will in fact be the full super sport seating experience. That can work both ways you see, some may really like it while others may find it too committed, but hey, there is always the Duke for them right? Now I rode the RC200 right after spending some quality time on the RC390, right here in Chakan as well as earlier in the week. 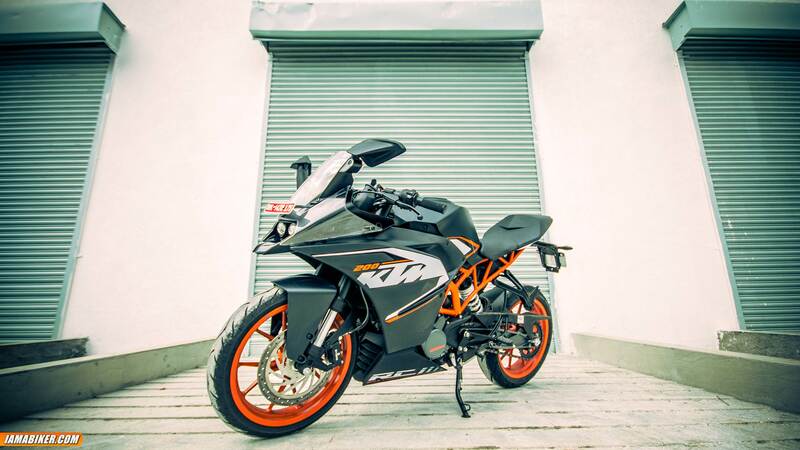 And the best thing about the RC200 is that there is a lot of practically “usable” power, and why I say that is because, you are never really going to be able to use all that explosive power from the RC390 on the streets, you can, but add in any sense of the word practicality and the RC200 takes the prize. 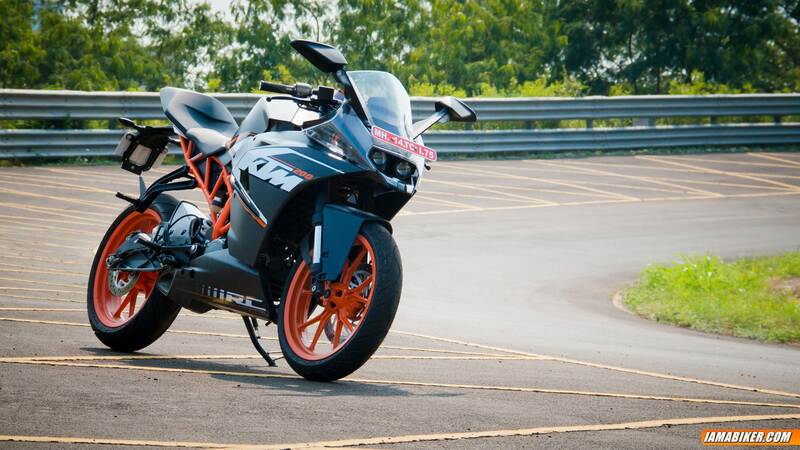 It’s nimble, its fast, it definitely is more efficient than the bigger RC390. At the end of the day how many of these will actually make it to a nearby track, Oh wait, there is no such thing as a nearby track, how lucky we motoring enthusiasts in India are. Another thing I should point out is that the RC200 is a lot more refined and composed at lower rev’s, something that takes a miss on the RC390, but more on that later. The build quality is good all over but yes there are some chinks in the armor. There is one thing in particular that might be a pain long term. The single piece front clear glass shield, that is going to be a tough one to clean. And if you look closely there are some areas around the motorcycle that you wish were different. But with ex-showroom prices at the 1.6 lakh mark, it ticks the most important box, something we like to call the power to price ratio, and that makes it very appealing. 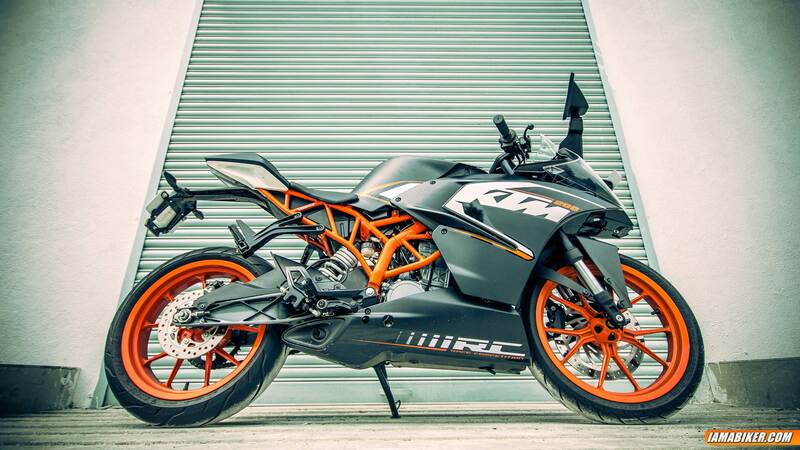 So, in short if you want to roll the streets in style, while keeping things moderately sane and economical, the KTM RC200 is for you. P.S. – Below are some wallpapers of the RC200, just click on them to open the high resolution version.